Possession: Often times the only way to detect a Goa'uld is from the glowing of their eyes, which often happens during strong bouts of emotion. If the Symbiote dies within a host, it can kill the host if it should wish. Power-Loss: The Goa'uld when possessing a host, only has access to the symbiosis multi power, and the Genetic Memory. And the Alternate part of the possession power. 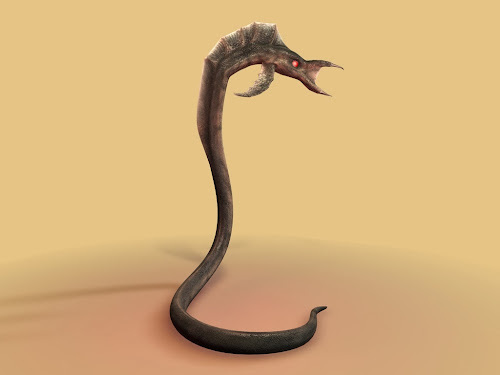 Personality Quirks: The Goa'uld are not only hell bent on taking over known space, after using the Sacrophagus to extend their lives. Many are just plain pyscopahtic and down right evil. They all possess a God Complex, usually attempting to take on the role of a cultures god , so they can be worshipped. The System lords hold a loose alliance with each other, but are extremely territorial and each has their own goals and ideas of conquest, which usually has something to do, with taking out one of their own to do so. In the Stargate universe, the word "Goa'uld" means "children of the gods". The Goa'uld evolved on the planet P3X-888, where there are still populations of primitive Goa'uld. Their original hosts were the Unas, also native to the planet. The Goa'uld largely abandoned P3X-888 after deciphering the Stargate, spreading throughout the galaxy and conquering other races. Eventually, the Goa'uld began to die out, until in the eighth or ninth millennium BC Ra discovered Earth and found ancient humans to be much more suitable hosts, due to the ease by which they can be repaired by Goa'uld technology. The Goa'uld ruled Earth for thousands of years, in the personae of gods from Earth's classical religions. It is never clarified, however, whether the Goa'uld impersonate deities that already existed in human mythology or if they themselves were the origin of those deities. From the humans, the Goa'uld engineered the Jaffa, who serve as soldiers and incubators for their young. They also transplanted humans from Earth throughout the galaxy via the Stargate network to serve as slaves and potential hosts. Last edited by JoshuaDunlow on Wed Jan 08, 2014 9:31 pm, edited 3 times in total. Bladewind wrote: Wow. Nice Go'auld build. Might lower the rank then. hmm.. Maybe like 10 ranks. I had though that perhaps Summon might be an interesting use for the Possession. But felt that this wasn't exactly accurate. I don't think that is necessary really to sink points into sidekick really, unless we are talking about NPC hosts. For instance, this is the Go'a'uld on its own, but inside a host it might simply be a template with the Genetic Racial Memory and the Symbiosis power. Building a Tok'ra would be identical, as the ability to switch personas is largely a role playing advantage. Exactly, And I have done the same thing in the past. Making things far more complicated than they needed to be. And Yep, thats how it would work. That gave me the idea for the other complication thanks! Glad to be of assistance ! Bladewind wrote: Glad to be of assistance ! Symbiotes can survive outside the host. Though the Larval, not without some help. They do require submersion in appropriate fluid, and a constant low level electrical impulses. I stand (sit) corrected ! I've been watching a lot of SG1 again. A Sarcophagus is a device the Goa'uld use to rapidly heal injuries and extend their lifespans. The device can also bring the recently deceased back to life. Despite the fact that the Goa'uld are scavengers and thieves of technology, there are a few of them who have come up with quite impressive adoptions of technology they have stolen and/or studied. Based on the Ancient healing device, but heavily modified so a human can use it, the Sarcophagus is one of the more impressive Goa'uld inventions. Feature: Prolonges the life span after repeated use. Pretty much halting the aging process while being used. The user is Immune to Aging, as long as they are in a Sarcophagus. Psychological effects: After repeated use, the psychological side effects can include megalomania and intense notions of superiority. This is one of the reasons that make the Goa'uld and Tok'ra different from each other, as the Goa'uld are evil and megalomaniacal. Some Goa'uld, such as Yu use the device nearly every day. "I'm a simple kinda guy. " Last edited by JoshuaDunlow on Tue Jan 14, 2014 5:39 pm, edited 7 times in total. "I have read of a place where humans do battle in a ring of Jell-O." - O'Neill and Teal'c, taking some leave, "Ascension"
Prejudice: Sho'fa: Amoung the ranks of the Goa'uld and Jafa still loyal to their gods, he is the Sho'fa. Symbiote Dependancy: Its dependant on a symbiote for their immune system. Without it a Jaffa will die. They were created to host a larval goa'uld till they reach maturity. Teal'c looses this by season 7, when he starts taking Tritonan. Re: JD's 3E Thread: SG 1 Stuff! The Pudding Gun: Ocassionally his guns can get gunked up. Quirk: Morte has anger management & Self esteem issues. And really hates it when people laugh at him, or don't take him seriously. Behold The Pudding Man, aka Morte Flannigan, a world famous pastry chef. Who turned to a life a crime, when his high tech cullinary skills made him the laughing stock of the food world. He has joined with several other villains to form a super villain group , that makes trouble for the local police force. Morte has anger management & Self esteem issues. And really hates it when people laugh at him, or don't take him seriously. He has created a specialized suit, and gun to help him commit crimes. No one can stop his cullinary genius. His suit looks pretty much, like a blob of chocolate pudding that covers a specialized group of tanks upon his back. From which a nozzle connects to his Pudding gun. Coming up next... The Gingerbread Man!! How, HOW is it that the Pudding Man has never done battle with Batman? Brilliant! He deserves his own limited series/recipe book!